-- US Health & Human Services Region 6 Director Marjorie Petty attended an assembly with 300 leaders of Dallas Area Interfaith, praising their strategy as "amazing" and "a model for others in the country to follow." DAI showed off their multi-colored healthcare enrollment booklet, which has already been distributed to 30 thousand individuals. Leaders plan to reach hundreds of thousands. -- In the Rio Grande Valley of Texas, along the border with Mexico, 220 leaders, representatives of healthcare entities, three Hidalgo County commissioners and State Representative Sergio Munoz gathered to create tangible ways of reaching the uninsured. 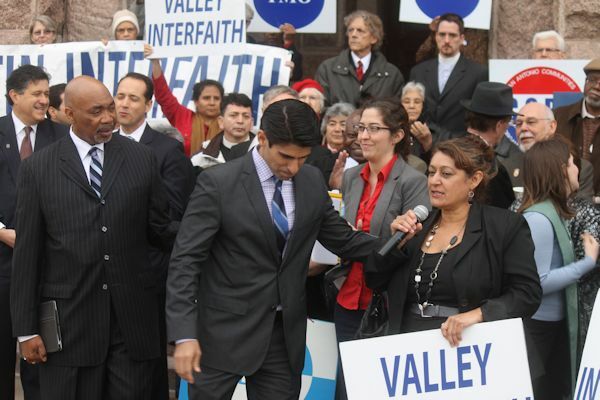 County Judge Ramon Garcia declared, "I stand with Valley Interfaith" in strategy to coordinate public entities. -- In San Antonio, COPS/Metro Alliance convened 100 public stakeholders to coordinate healthcare enrollment efforts in San Antonio and Bexar County. In photo, Sr. Gabriella Lohan presides over press conference with Congressman Lloyd Doggett, University Health System CEO George Hernandez and Bexar County Judge Nelson Wolff. -- 100 congregational and other institutional leaders of The Metropolitan Organization of Houston graduated from healthcare enrollment bootcamps, ready and committed to teaching others how to enroll. Some leaders are already planning neighborhood walks to further spread the word. -- 200 Spanish-speaking leaders convened in early October to learn how to make enrollment in affordable healthcare available to families in El Paso. The next day, an additional 25 English speaking leaders showed up to learn the same, at the same church. EPISO & Border Interfaith aim to hold 50 presentations over the next few months of the Texas healthcare showdown. In Texas, leaders from across the state rallied in their communities and at the Capitol to encourage state lawmakers to expand access to health care, either through Medicaid or an alternative bi-partisan bill calling for a 'Texas Solution.' While neither passed in the Legislature, conversations generated by the campaign led to six counties passing bi-partisan resolutions supporting the proposals, as well as local partnerships to improve the implementation of the Affordable Care Act for low-income families and individuals. Dallas Area Interfaith leaders were asked by the county judge to develop a strategy in concert with hospitals and insurance companies to enroll residents in the national health exchange.